A sweet brown sugar glaze takes this easy asparagus recipe to the next level. Cook it up on the stove-top in under ten minutes for a veggie side your kids will love! Asparagus can be a tad intimidating to kids. It’s green. And spiny-looking. And it’s got a lot of syllables. 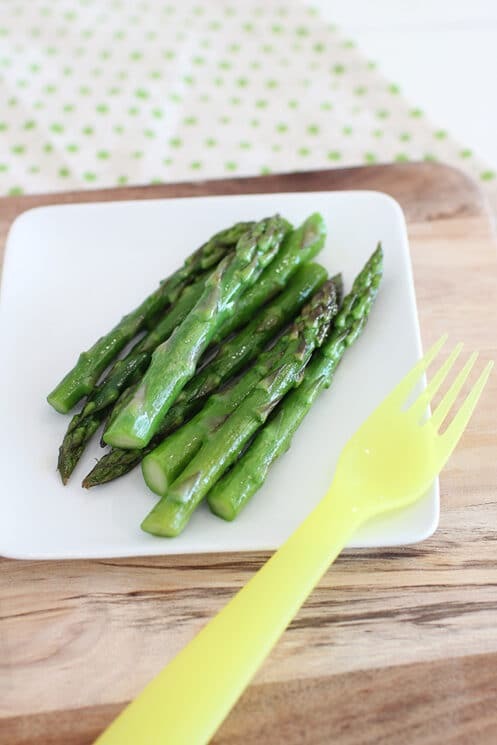 But this nutritious asparagus recipe might pleasantly surprise your kids, when they find that the sweetness and mild green-bean-like crunch of asparagus is tasty and easy to love. 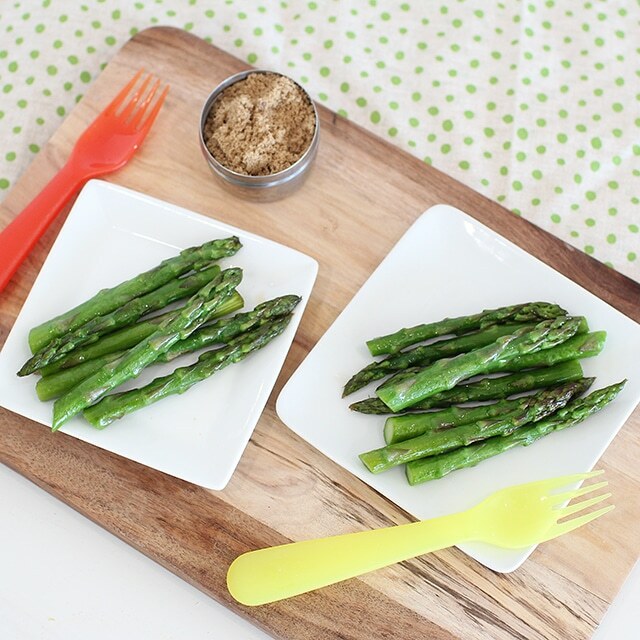 Asparagus is super healthy for kids, and a welcome change of pace from the usual carrots and peas on their dinner plates. It has tons of Vitamin K and folate, plus fiber and even a few grams of protein, which is a little unusual for a veggie. 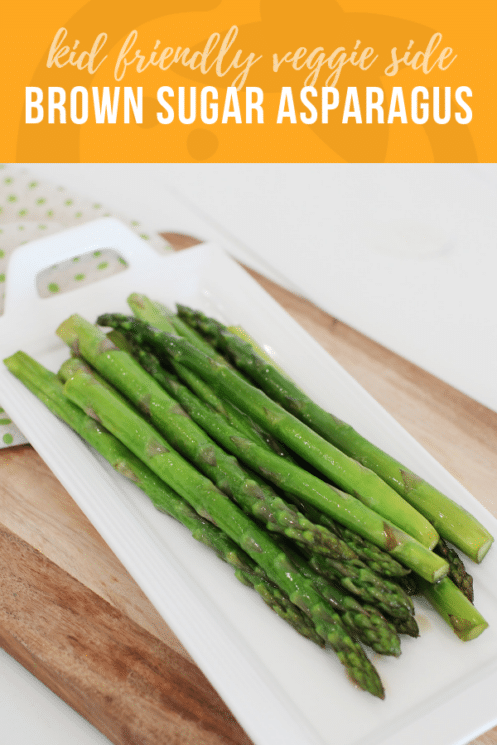 This asparagus recipe has a sweet flavor that’s naturally appealing to kids. And because it’s so quick to make, it’s also a side that’s doable for you, even when you have little ones in your midst, trying to get you to play with Hatchimals. What’s the Best Way to Cook Asparagus? Asparagus is a a tender spring veggie– the “spears” are actually the first shoots that push out of the ground in the early spring, and harvested before they grow into a huge strong plant. What this means is that it’s really easy to overcook asparagus. You’ll know if you do: it gets mushy and turns a not-too-attractive olive-drab color. The best way to cook asparagus, then, is lightly, and quickly. (Asparagus, you’re totally matching our weeknight vibe.) 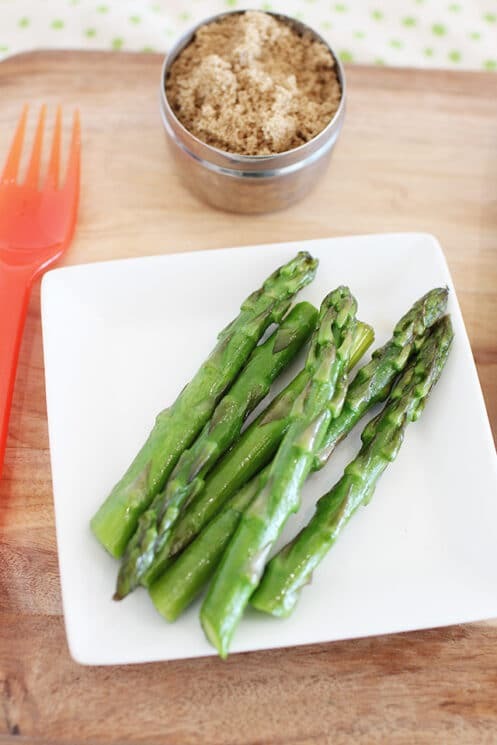 This Brown Sugar Asparagus recipe enhances the natural sweetness of fresh asparagus, while leaving the texture a little crisp, and the color bright and appetizing. Here’s a tip to help you know the right time to pull these spears off the heat: as soon as the color of the asparagus turns uniformly vibrant green, taste one. It’s likely to be done or almost done. If your asparagus is on the thick side, you might also want to cut the spears in half longways so they cook more evenly. 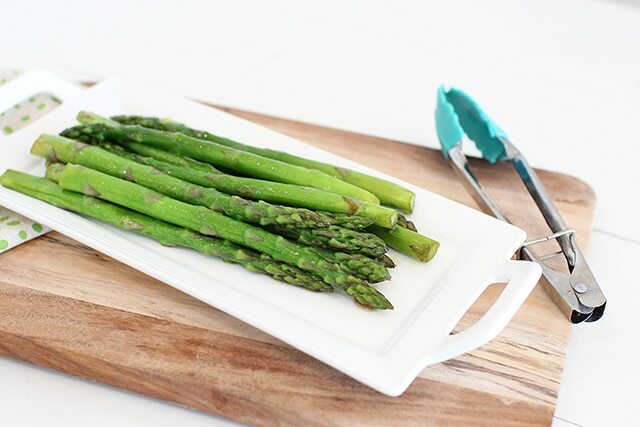 We wish you sweet success serving this asparagus recipe to your picky eaters tonight! For a more savory take on asparagus, try our Roasted Asparagus, too. Or check out 10 more healthy veggie side dishes to win over your littles. Cut the tough ends off asparagus, rinse and pat dry with a paper towel. Melt butter in a large skillet over medium heat. Stir in brown sugar until dissolved. Add asparagus and saute for 1 minute, stirring constantly. Add 2 tablespoons of water, cover, and simmer for 3-5 minutes, until bright green and tender; cook longer if a softer asparagus is desired. My kids ate asparagus for the first time yesterday. 2 out of 3 didn’t like it, but for the one who did it was a major victory. I made mine by spreading the asparagus out on a pan, drizzling it with olive oil and a sprinkle of salt and roasting it for 10 min. It was delicious. I also made a cashew curry mayo to go with it for the grown ups which was also a hit. We eat Asparagus weekly if we can! Our favorite way is to put them in a ziplock bag, add a drizzle of olive oil, a shake of garlic salt and a shake of lemon pepper and then grill them. In the winter I do the same thing, except I just roast them in the oven at 450 for 7-8 minutes (turn them once). They are so delicious! We LOVE asparagus so much that I purchased 7 lbs last week when it was on sale for $1.49/lb. We always cook ours the same way: drizzle with olive oil and lemon juice (approx. 1 lemon per lb), sprinkle with pepper, salt and crushed red pepped. Bake at 425 for 15-20 minutes, turning once. DELICIOUS! My kids LOVE asparagus. I steam it, broil it or grill it. They can’t get enough. We are lucky that we can get it at the farmer’s market.